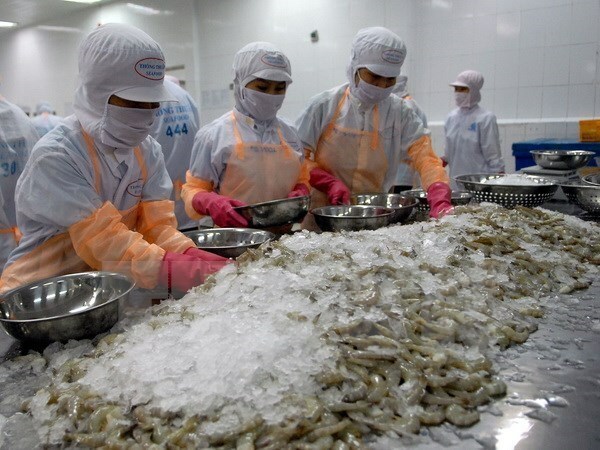 HCM City (VNA) – Vietnam’s shrimp exports to China reached 282.9 million USD in January-June, representing a year-on-year rise of 30 percent, according to the Vietnam Association of Seafood Exporters and Producers (VASEP). The association forecast further growth in shrimp export to China, a key market for many Vietnamese shrimp exporters, this year. According to VASEP, the market holds numerous opportunities for Vietnamese seafood businesses, as it has a large population and big demand. In addition, China imports shrimps for not only domestic consumption but also export to other countries. However, VASEP noted some difficulties facing Vietnamese exporters as China requires processing plants to have Chinese–granted codes and be included in a list of exporters approved by China in order to export their products to the market. At the same time, the Chinese market has continuously raised requirements for product quality over recent years. The VASEP suggested Vietnamese enterprises focus on improving the quality of products to make inroads in the market.